Might there be another electric streetbike from which to choose in the near future? Or perhaps another TTXGP contender? If a grainy bit of video that's appeared on YouTube is what it seems to be, then the answer to those questions is a definite maybe. Appearing from beneath a ceremoniously-removed red cloth, a motorcycle with jet fighter fairing is exposed to the world followed by footage of the machine working the corners and straights of the Parcmotor Castelloli racetrack. Built by Derbi , a subsidiary of Piaggio and the makers of the wonderfully-cool Derbi DH 2.0, the decals on the back fender of the GPR EV-dubbed bike and some other clues suggest the motor is an AC design from Perm Motor working with a Gen4 AC controller from Sevcon. 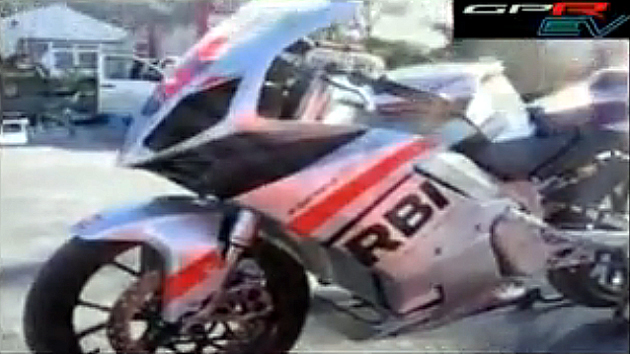 While we have yet to hear back from Derbi, rumors are circulating that this is a possible TTXGP entry by Piaggio. We're not sure how long this video will stay up (a previous version was removed from YouTube) so hit the jump to check it out while it lasts. Derbi testing electric motorcycle, the GPR EV [w/VIDEO] originally appeared on Autoblog Green on Tue, 15 Dec 2009 19:01:00 EST. Please see our terms for use of feeds. 0 comments on "Derbi testing electric motorcycle, the GPR EV [w/VIDEO]"